Spain's Andres Iniesta [ ] thought he was offside when he collected the ball and scored the winning goal in the World Cup final, the midfielder said on Tuesday. "I was only waiting for the pass from Cesc Fabregas [ ] and he delivered in a perfect way. He was very quick and for a moment I was alone and I really thought I was offside but I controlled it well and when I hit the ball I knew it had to go in," Iniesta said. The extra-time strike on Sunday was the only goal in a bad-tempered final against the Netherlands and secured Spain's first World Cup victory. 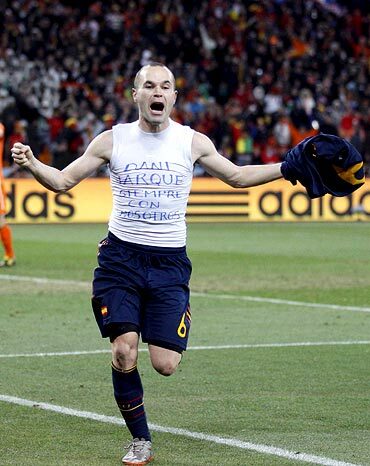 Iniesta was asked how he felt afterwards. "It is difficult to explain," he said. "I can only say that I feel very happy. Very happy...playing my football and doing my job and scoring such an important goal for all. "To be able to make millions of people happy is something priceless. This is what gratifies my job - to be able to make so many people happy who follow us and suffer with the team. People's happiness has no price." The Barcelona player went to South Africa [ ] after a difficult season plagued with injuries. "It was a difficult season and that's it. But then came the World Cup and I got into it with a lot of desire and ambition. I was hoping that everything finished well and despite losing the first match (1-0 to Switzerland [ ]) we came back from that, the team recovered well and everything ended as we know."